Save Your Soul - Pray the Rosary daily! Soviet Russia will collapse 70 years after the Bolshevik revolution of 1917. The prediction was made in the late 70s - early 80s. He saw a vision of the Turkish invasion of Cyprus in 1974 2 weeks before it occurred. The beginning of Armageddon will be near after Turkey closes the Euphrates River dam. Turkey will be divided in pieces. One piece will go to Greece; one Piece will go to Armenia and one to Kurdistan. The Dome of the Rock will collapse from bellow. Armageddon will be close when Solomons temple is ready to be rebuilt. Israel will attack its close neighbors with nuclear weapons when they see their end is near. Jesus says: "I have already told you, and through you I say so to many who are even less evangelized than you in my doctrine, that you must never judge. God alone is the judge. When, from the height of my throne, I see upright spirits pursuing their longing and seeking God with every means at their disposal, seeking to serve and love this God with all their strength, I justify them and make them pure and pleasing in my sight as children of mine, and where men fall short, I make up for it by granting spiritual lights. And here are a few more prophesies in a more analytical form. – Today they're trying to destroy faith, and for the edifice of faith to fall they quietly pull out one stone, then another. But we're all responsible for the destruction; not just those who destroy but we who see how faith is being undermined and make no effort to strengthen it. As a result the seducers are emboldened to create even greater difficulties for us, and their rage against the Church and the monastic life increases. The spirit of Luke warmness reigns. There's no manliness at all! We've been spoiled for good! How does God still tolerate us? Today's generation is the generation of indifference. There are no warriors The majority are fit only for parades. Godlessness and blasphemy are allowed to appear on television. And the Church is silent and doesn't excommunicate the blasphemers. And they need to be excommunicated. What are they waiting for? Let's not wait for someone else to pull the snake out from its hole so that we can live in peace. – They're silent out of indifference. What's bad is that even people who've got something inside have begun to grow cool, saying: "Can I really do anything to change the situation?" We have to witness our faith with boldness, because if we continue to be silent we'll have to answer in the end. In these difficult days each must do what's in their power. And leave what's out of their power to the will of God. In this way our conscience will be clear. – “It's possible that you'll live through much which is described in the Book of Revelations. Much is coming to the surface, little by little. The situation is horrible. Madness has gone beyond all bounds. Apostasy is upon us, and now the only thing left is for the 'son of perdition' (2 Thess. 2:3) to come. The world has turned into a madhouse A great confusion will reign, in which each government will begin to do whatever comes into its head. We'll see how the most unlikely, the most insane, events will happen. The only good thing is that these events will happen in very quick succession. – “A great discord will arise. In this discord everyone will clamour for a king to save them. At that moment they'll offer up their man, who'll say: "I'm the Imam, I'm the fifth Buddha, and I’m the Christ whom Christians are awaiting. I'm the one whom the Jehovah's Witnesses have been waiting for. I'm the Jewish messiah." – “The Zionists want to rule the earth. To achieve their ends they use black magic and Satanism. They regard Satan-worship as a means to gain the strength they need to carry out their plans. They want to rule the earth using satanic power. God is not something they take into account. One sign that the fulfilment of prophecy is near will be the destruction of the Mosque of Omar in Jerusalem. They'll destroy it in order to restore the Temple of Solomon which used to be on the same place. In the end the Jews will pronounce the Antichrist messiah in this rebuilt temple. The rabbis know that the true Messiah has already come and that they crucified Him. They know this, and yet they are blinded by egoism and fanaticism. Two thousand years ago it was written in the Book of Revelations that people will be marked with the number '666'. As Holy Scripture says, the ancient Hebrews laid a tax on the peoples they conquered in various wars. The yearly tax was equal to 666 talents of gold. (3 Kings 10:14, 2 Chronicles 9:13.) Today, in order to subjugate the whole world they'll once again introduce the old tax number linked to their glorious past. That is, '666' is the number of mammon. - Everything is going as planned. They put the number a long time ago on credit cards. As a result, he who is not marked with the number '666' will be unable to buy, sell, get a loan, or find work. Providence tells me that the Antichrist wants to subjugate the world using this system. It will be foisted upon people with the help of the mechanisms which control the world economy, for only those who receive the mark, an image with the number '666', will be able to take part in economic life. The mark will be an image which will first be placed on all products, and then people will be compelled to wear it on their hand or forehead. Little by little, after the introduction of ID cards with the three sixes, after the creation of a personal dossier, they'll use cunning to introduce the mark. – In Brussels a whole palace with three sixes has been built to house a central computer. This computer can keep track of billions of people. And we Orthodox are resisting this because we don't want the Antichrist and we don't want dictatorship either. "The most we can suffer is martyrdom." There will be three and a half hard years. Those who don't agree with the system will have a rough time. They'll constantly be trying to imprison them, using any pretext they can find. They won't torture anyone, but without the mark it will simply be impossible for a person to live. "You're suffering without the mark", they'll say. "And if you had just accepted it you would have had no difficulties." For this reason, by learning to life a simple, moderate life here and now you'll be able to get through those years. By getting a little bit of land, raising a little wheat and some potatoes, planting some olive trees, and keeping animals of some sort, a goat or chickens, the Christian will be able to feed his family. Stockpiling is of little use: Food doesn't keep for long before spoiling. But these oppressions will not last for long: three, three and a half years. For the sake of the chosen the days will be hastened. God won't leave a person without help. Tomorrow thunder will strike, and the brief dictatorship of the Antichrist-Satan will come. Then Christ will intervene; will give the whole anti-Christian system a good shaking up. He'll trample upon evil and turn everything to good use in the end. – The Russians will take Turkey. The Chinese will cross the Euphrates. Providence tells me that many events will happen: The Russians will take Turkey and Turkey will disappear from the world map because a third of the Turks will become Christians, another third will die in the war and another third will leave for Mesopotamia. – The Mid-East will become a theatre of a war in which the Russians will take place. Much blood will be spilled. The Chinese, with an army of 200 million, will cross the Euphrates and go all the way to Jerusalem. The sign that this event is approaching will be the destruction of the Mosque of Omar, for its destruction will mark the beginning of work by the Jews to rebuild the Temple of Solomon, which was built on the same spot. – There will be a great war between Russians and Europeans, and much blood will be spilled. Greece won't play a leading role in that war, but they'll give her Constantinople. Not because the Russians adore the Greeks, but because no better solution will be found. The city will be handed over to the Greek Army even before it has a chance to get there. The Jews, inasmuch as they'll have great power and the help of the European leadership, will become proud and insolent beyond measure and conduct themselves shamelessly. They'll try to rule Europe. As books published after his repose indicate, Elder Paisios was a man of lofty spiritual life. He received many heavenly visitations from our Lord Jesus Christ, His Most Holy Mother, and the saints; he was granted the gifts of clairvoyance and of miracle-working; he beheld the Uncreated Light in divine vision; and he was filled with God’s Grace to such an extent that he attained to deification (theosis). There is no doubt that Elder Paisios’ impressive spiritual gifts and attainments have contributed to the widespread veneration of his memory in contemporary Greece. However, these gifts are not the only — or even the primary — reason he has come to be so greatly loved. For the main explanation as to why he is so loved by the people, we must look at the love which he had for the people. That love, borne aloft by the Grace of Christ, was seemingly limitless. Elder Paisios poured out his heart in love for his fellow man. 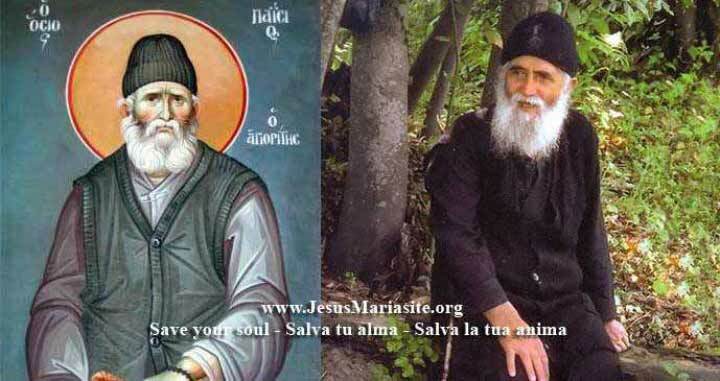 As his spiritual children have written, “His sanctified soul overflowed with divine love, and his face radiated Divine Grace” (Elder Paisios of Mount Athos, Epistles, Souroti, Thessalonica, Greece: Holy Monastery of the Evangelist John the Theologian, 2002, p. 10). He suffered with people, listened to them, offered them hope, and prayed for them untiringly. He spent his nights in prayer and his entire days in relieving human pain and spreading divine consolation. He guided, consoled, healed, and gave rest to countless people who took shelter in him. In his spiritual counsels, many of which have been recorded in writing, Elder Paisios tells us how we too can enter into the experience of such overflowing, Grace-filled love. The path he sets for us is indeed a hard and narrow one, for it is none other than the path that Christ has given us. 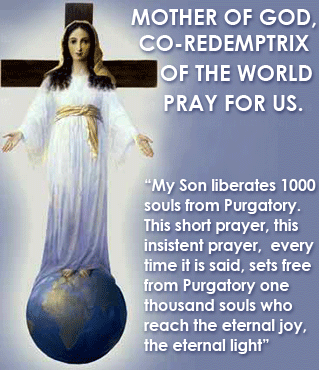 "Mother of God, Co-Redemptrix of the world, pray for us"
Give a joy to the suffering Souls of the Purgatory. Pray this simple prayer frequently and with faith. The blessed Souls, in return for your spiritual charity, will pray God for you and your loved ones to reach eternal life. I AM your Father, These words are Mine!" Go to Mass on the first Friday of the month, have a Confession (needed if your soul is in mortal sin), receive the Holy Eucharist, for nine consecutive months without skipping one first Friday (or you have to start over). The Magnificent Promises: "The soul who prays them will suffer no Purgatory. The soul who prays the 12 Year Prayer will be made conscious of his death one month in advance and more..."
No sudden, violent, by air, land, sea accident, by drug, by war, by natural disasters Death. You will be 100% prepared and at peace. The Grace of God, in Person and through the Sacraments, will assist you at the very last instant of your life on Earth. Read the Magnificent Promises. Take advantage of these Opportunities of Sure Salvation that death cannot destroy. You are destined to Heaven. Nothing on Earth deserves your ambition: SAVE YOUR SOUL. Piensa... 9 primero viernes del mes en seguida, confesado, asistir a la misa y haciendo la Comunión, pare recibir la salvación de tu alma. Salva tu alma con la ayuda de la Madre de Dios. "A todos aquellos que por cinco meses consecutivos, el primer sábado de cada mes se confiesen, reciban la santa Comunión, reciten el Rosario y me hagan compañía durante quince minutos"
No pierda esta oportunidad de salvación El alma que las reza puede elegir a otros tres a quienes Jesús mantendrá luego en un estado de gracia suficiente para que se santifiquen." Ninguna MUERTE repentina, violenta, por accidente de aire, tierra y mar, por droga, por guerra, por desastres naturales. Usted estará 100% preparado y en paz. La gracia de Dios, en Persona y a través de los Sacramentos, le ayudará en el último instante de su vida en la tierra. Lee las Magníficas Promesas. Aproveche de estas Oportunidades de Salvación Segura que la muerte no puede destruir. Tú estás destinado al cielo. Nada en la tierra merece tu ambición: SALVA TU ALMA. Just pray if you are in doubt or you do not understand what happened to Pope Benedict and the role of Pope Francis (he is pope even if you may not see him as such) and the confusion in the Catholic Church and in the world. The enemies of the Church: the children of darkness are smarter than the children of Light, they want to destroy what Jesus created. Do not help them by criticizing the actual Pope and the Consecrated ones, be careful about what you read in the news or on Internet. Pray, Pray, Pray, with sincere heart for discernment to understand the hidden side of the unfolding events in these end times. Ask God and the Blessed Mother to help you know the truth and to be at peace. Pay attention to the words of the Consecration, during Mass. The one (it can be a Pope, a Cardinal, a Bishop, a Priest), who changes those words has embraced heresy and Jesus is not present on the altar. Leave that church and look for a traditional Priest. Do not let satan and his demons fool you. The next pope will serve the antichrist. "No more Communion in the hand, no more lay to distribute Communion because this sacrilege is causing the loss of many souls!" Little children, it is impressive the amount of Eucharistic violations that are committed by those defined in this way: Extraordinary Ministers of the Eucharist. Many of my lay children with the complacency of the Priest, exercise the Ministry of the Eucharist in many churches; their pride is common in many of them and it is reaching the point where many of the decisions that are taken by the priest, are being delegated to the laity. What a suffering I feel in My Heart, in seeing that many of My lay children desecrate sacred objects, taking from the Tabernacles, with their unworthy hands, the Cup where the consecrated hosts are present. I say to you: Only the consecrated hands of My beloved ones can touch the Chalice with the Consecrated Hosts, and only their hands may distribute Communion! I beseech you beloved Children (the Priest): do not delegate anymore this sacred Ministry to My lay sons; do not make them guilty of sinning. Leave your conveniences and fulfill the Ministerial Priesthood that has been conferred on you! I ask my beloved ones: what are you going to respond tomorrow to My Father, for all the abuses and the outrages that many of you are committing with the Divinity of His Son? Heaven is crying with Me, in seeing how outraged and disfigured Jesus is in the Blessed Sacrament in many of His Houses. My opponent enjoys any desecration that My Son receives. Many Consecrated Hosts get lost to end up into satanic churches for the celebration of black masses. My opponent has infiltrated in many of my Son's Houses, many extraordinary ministers of the Eucharist that betray Him by stealing consecrated hosts which are used to perform satanic cults. Thousands of Consecrated Hosts are sold and depending on the Minister of the Church who consecrated Them, in order to determine their price. A Consecrated Host by the Pope, by a Cardinal or by a Bishop, is sold at a high price and with these, they make a satanic special rite to cause damage to the Eucharistic Body of my Son, represented in His Church. Satanists are destroying religious and priestly communities, with these Hosts Consecrated by the high rank Ministers of the Church. My beloved ones, I ask you to stop this outrage to the Divinity of My Son that is being carried out by my lay children. Every insult and desecration that My Son receives is a sword piercing My Heart. Many of my favorites lie in hell who in life have allowed these abuses to the Divinity of My Son, and with them many lay people, extraordinary ministers, whose spiritual pride did not allow them to repair and to ask for forgiveness from God for such a vile abuse. As Mother of the consecrated souls in my dedication as Mystic Rose, I ask you with all My Heart, My beloved children, to stop as soon as possible this abuse and outrage that is being committed against my Son's Divinity, because tomorrow you do not have to lament from it. Little children, no more Communion in the hand, no more lay to distribute the Communion, because this sacrilege is causing the loss of many souls! Your Mother, Maria the Mystic Rose." Go to have a Confession, cleanse your soul. Save your soul! No need to live with the big rock of your sins tormenting you all your life. It is easy: see a Catholic priest. Give yourself a new beginning before it is too late. "If you knew, how you shine after having properly approached the Sacrament of Confession. As He (Jesus) is in the Confessional and where He listens to every word, sees in every corner of your heart and He is longing to bestow the Graces inherent to His forgiveness. "Parents, be very attentive of your children as my adversary wants to destroy families. Be very careful with what your children see, read, listen and play. I tell you this because the instruments of Evil, are using technology to slowly poisoning young souls through games, music, movies, videos, TV shows and literature loaded with subliminal messages that are driving many to spiritual and even physical death"
"Parents, correct the ways if your family, have much dialogue with your children, make time to listen to them as many homes are being lost due to lack of love, dialogue, understanding and most specially for not inviting God. Take God back into your homes, pray my Holy Rosary, as the family that prays together stays together." ALL KNEEL AND PRAY TOGETHER. to proclaim Your complete dominion over our family. which You have so strongly denounced. You will rule over our minds through our deep and living faith. by the frequent reception of You in Holy Communion. bless all our family undertakings, both spiritual and temporal. Sanctify our joys and comfort us in our sorrows. of Your infinite love and mercy for the penitent sinner. we humbly accept Your divine will. will be united lovingly with You in heaven forever. to the infinite mercy and love of Your Sacred Heart. St. Joseph, to offer You this family consecration of ours. May the memory of this consecration be with us always. and for absent members, living and dead. I consecrate myself today to your Immaculate Heart. To you I entrust all that I have, all that I am. in health and in sickness, in life and in death. which you lamented so sorrowfully at Fatima. I want to be pure like you. I want to atone for the many crimes committed against Jesus and you. and the whole world the peace of God in justice and charity. without regard for human respect. with all my sacrifices in the spirit of penance and reparation. Amen. and to be more faithful to Him than I have ever been before. I choose thee this day for my Mother and Mistress. for the greater glory of God, in time and in eternity. Amen. "I will refuse no one their chance to petition My Heart under this title. None will be left unaided. My special attention rests upon those devoted to Me as Refuge of Holy Love." "Today, I ask clergy and religious to rely upon the Protectress of the Faith to safeguard the treasure of their vocations which are so greatly under attack." Save your soul - Salva tu alma - Salva la tua anima - Pray the Rosary daily!